I finally got working on my Green scraps for the month of May. I pulled out my "Around About" project. 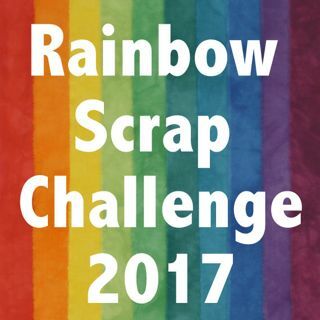 Last year I started with the colours of the month according to the Rainbow Scrap Challenge 2013. First was Pink then Purple then Orange and April was Green. For the Green I had the fabric set aside but nothing more done. So this Month in the Colour is Green again and I wanted to get back to this project. I had lots of wonky green strips left over from other free form cutting art projects, most are hand dyed fabrics. I am not sure which way is up now. I had designed it yesterday with the top photo but then I had it this way for all the other colours. We will see what happens later, sometimes It just tells you how it will be. I also did two spools. The first one I did was Lime green and I did it the wrong size again. Oh well. They were to be 8" square and I keep sewing too many little strings together and cutting the side parts 6 1/2" long when they should be 4 1/2" long. What a fun project - I love how the scrappy all come together to form such a beautiful expression of color. Spools come in different sizes... Love yours, and the free form is wonderful. It'll be interesting to see where it goes. Genius idea. What a great idea adding to your project from last year, it's beautiful. Are you going to carry on incorporating any colours from this 2014 Challenge? 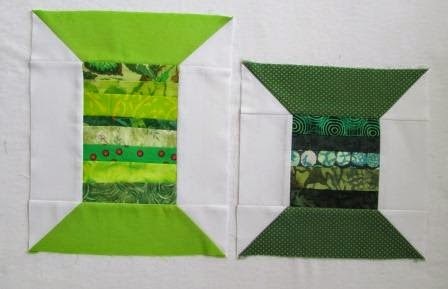 Maybe you made a design choice by accident & can put the little spools and big spools together in a quilt!! 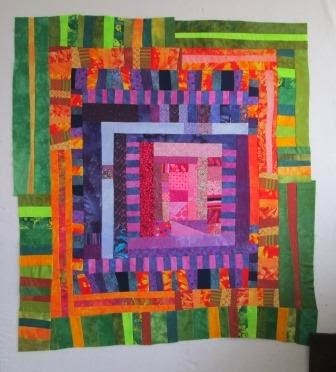 I also like your free form quilt top---with each added color---it grows more interesting. How is your adorable puppy doing?? 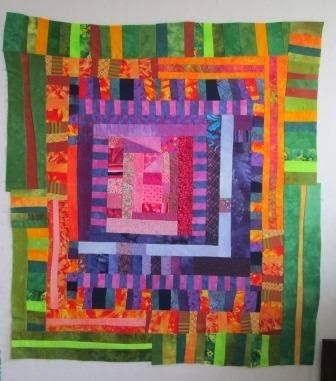 I love your quilt - so vibrant! What fun! Glad that green has come around again for you. Sounds like you just want to have two sizes of spools in the quilt - or two quilts =) Your round about is lovely.